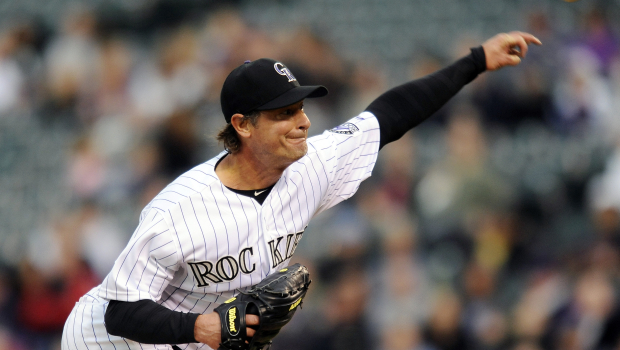 Creeping closer to seniors discounts at local restaurants, Jamie Moyer became the oldest pitcher to win a game in the bigs, a 5-3 victory over the San Diego Padres. Cheers Jamie! LIVINGSTONE: I’m beginning to look into my future a little bit more these days, especially when it comes to baseball. It coincides with life, maturity, professional desires, life, family, etc. It’s normal, I suppose, so it’s carried over into the ‘what-ifs’ of my sports passions. Will Ben Roethlisberger make it to another Super Bowl? Will The Flyers win a Stanley Cup in the next five years? Will the Leafs ever win one in my lifetime (or my hypothetical child…and their kids.)? The question that popped into my head last night came on the heals of a new baseball record, now enshrined in the Hall of Fame: Will Jamie Moyer ever retire? Moyer, at the young age of forty-nine, became the oldest pitcher in history to win a baseball game. Pitching now for the Colorado Rockies, after pitching for almost every team in baseball (that’s not true, but it seems like it, he’s only pitched for eight) he kept the San Diego Padres’ hitters at bay with his lightning-fast 79 mph fastball and his nasty cutter. The Rockies won 5-3. Moyer, 49 years, 150 days old to be exact, takes the record held by Jack Quinn of the Brooklyn Dodgers, who was 49 years, 70 days old when he set the record. Wait, the Brooklyn Dodgers? Yep, the record was set on Sept. 13, 1932 when a bottle of Coke was five cents and the Second World War was yet to happen. It’s an incredible feat. To be able to pitch for 25 years, for eight clubs, play with Ryne Sandberg, Ken Griffey Jr., and Carlos Gonzalez (in three different decades mind you) amass 268 wins and over 2,400 Ks – it’s unreal. Moyer is the third oldest pitcher ever to play in a regular season game (behind Quinn and Satchel Paige who was, get this, 59(!!) when he played in 1965) and is tied for sixth on the oldest player, pitcher or position, to play (he’s tied with the likes of Julio Franco (2007) and Hughie Jennings (1918), among others). It speaks a lot to not only the longevity of his ability to play – but to the fact he has been able to continue pitching, after 25 years and more than 4,000 innings, without his body, or love for the game, saying that’s enough. Sure, he gets a paycheck, and a pretty decent one in the grand scheme of life, but at this point in his career, he just seems to want to keep playing the game he loves so dearly.